Having worked with project investors in the public and private sector, most have one thing in common and that is the concern of project actual cost at completion exceeding their project approved budget or investment. A project that exceeds its approved budget could result in lower return of investment that made the project an attractive investment to select. It is for this reason, investors need to have a formal process for monitoring, evaluating and reporting project’s budget performance during the project delivery stages to reduce the likelihood of having a project that goes over budget. To start with, the project investor needs to decide on the format and level of details that the project budget will be managed, controlled and reported at. The Cost Breakdown Structure (CBS) is the technique used to achieve this be determining the levels to project budget will be detailed at. The CBS could be based on combining different construction standards and categories in building the CBS levels. The example below shows a simplified two-level CBS that is based on the Construction Specification Institute (CSI) categories. In addition, the project investor needs to decide on the financial periods for reporting the budget performance. Those financial periods will be aligned with all other financial applications that could have an impact on the project budget. Those financial periods will be used to plan the approved budget spending as well as capture the actual cost spent within the same period. A key component of any project investment is the timeline for completing the investment to start earning the anticipated revenue and capture the planned benefits. This needs to have a schedule that will detail main elements of the project investment and associated milestones. The schedule will also help in determining when the project budget elements will be spent. Although one would anticipate having a detailed project schedule by the contractors who will be eventually constructing the project, but as an investor it is important to have a master schedule to fulfill the needs of monitoring, evaluating and reporting the budget performance. A project budget is usually based on a cost estimate that could be have been done by the project investor team, project consultant or a third party cost consultant. The cost estimate is based on the defined project scope of work and level of detail (LOD) which will vary as the project moves from concept, schematic, detailed design development to the construction document stage. The project cost estimate should cover direct and indirect costs as well as fixed and variable costs. 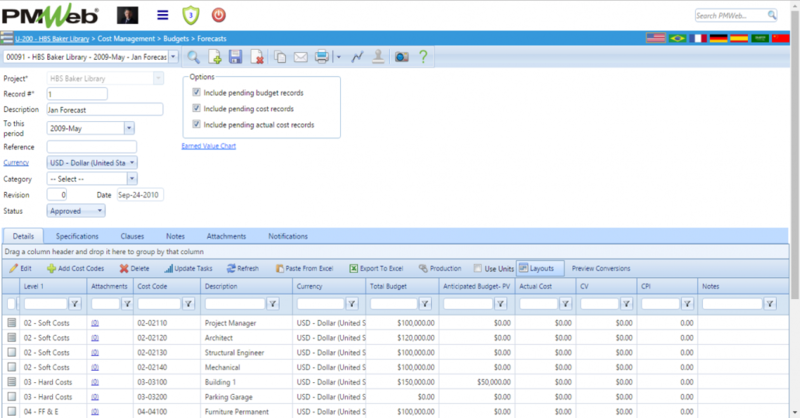 Software applications like Nomitech CostOS provides a powerful platform for developing the project cost estimate using international and local cost databases. It has a smart cost assembly that provides a quick and accurate templates for estimating the different components of the project based on best practices and standards. 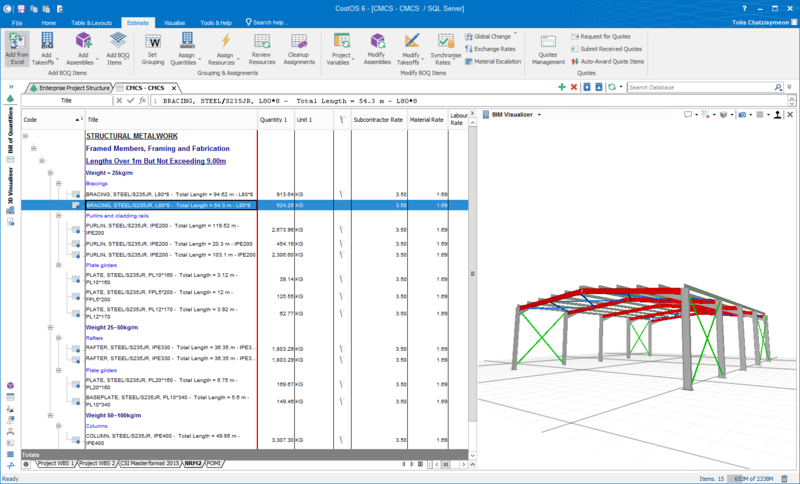 In addition, it captures the quantities of work to be completed from the Building Information Model (BIM) with the option to also capture quantities from drawings and other traditional methods. The Royal Institution of Chartered Surveyors (RICS) method of measurements are much better when used in developing the cost estimate in that essence as everything is well described and creates billable items. Therefore, it is recommended to use POMI and SMM7 or NRM2 standards for developing the project cost estimate. Nevertheless, for managing the project budget, it is better to use the Construction Specification Institute (CSI) for which Nomitech CostOS can group and organize the same cost estimate done in POMI and SMM7 or NRM2 standards in CSI standard. Regardless of the level of the detail of the project, we all understand that many assumptions have to be done when developing the cost estimate. Therefore, it is a must that the Project Investor insists on having a formal risk management process in place. The risk register will help the project team in estimating the different type contingencies to be considered based on the assumptions made and identified project risks. Regardless of what cost estimating software application is used, all cost estimates need to be imported into PMWeb to ensure that this important data is properly documented and tracked. 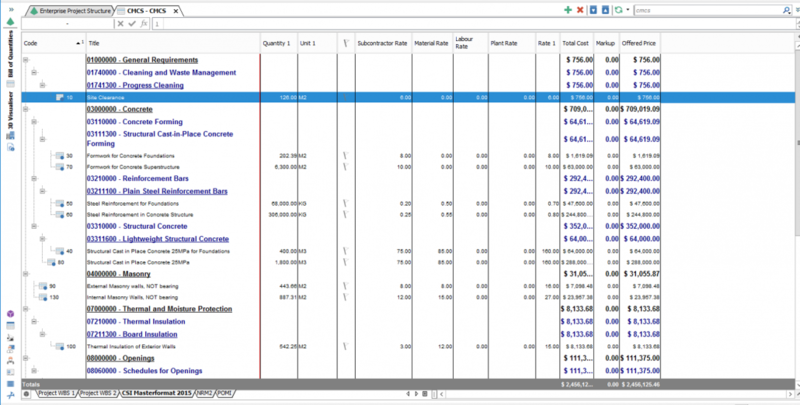 The cost estimate from the dedicated estimating software applications will be saved as MS XLS file and then imported into PMWeb cost estimating module. It is important to capture all cost estimates versions done during the pre-contract project life cycle stages to ensure transparency and accountability. For each estimate version, all drawings, BIM models and documents used in the cost estimate needs to be stored and attached to the estimate. It is highly to have a formal workflow in place to submit, review and approve the cost estimate to enforce governance. The approved cost estimate will be used to generate the project budget. Accordingly, one should expect that similar to cost estimates, a project could have many budget versions but only one budget can be labelled as the approved budget. The budget created from the approved cost estimate needs to be reviewed and additional cost items for funding and financing, contingency, management reserve, marketing, minimum target profit among others needs to be added. It should be noted that for both cost estimate and budget, line items could be priced at different currencies. This is needed when part of the project scope of work depends on products and services that are priced at different currency than the project’s currency. This is becoming a widely accepted practice as it will help in eliminating the contingency funds usually added to address risks associated with currency fluctuation. For each line item in the project budget, we need to determine when it is planned to be spent. This is very important to determine the project cash flow and how much funds need to be allocated every fiscal year. The allocated budget for each line item could be spread in different ways to simulate how it will be actually spent when the project is executed. Before proceeding with the solicitation of bids to deliver the project scope, the project budget must be formally approved by the investor. The project could be tendered as one single lump contract or multiple single lump contracts also known as bid packages. PMWeb PMIS has a number of modules to ensure a comprehensive project buyout process. It has modules for prequalifying contractors who will be invited to bid, online bidding to capture the contractors’ bids and bid analysis module to compare the contractors’ commercial bids as well as ensure all needed documents where submitted. PMWeb custom form builder is also used to design and perform the technical evaluation for the bidders. The conclusion of the buyout process is to have a commitment agreement with the approved terms and conditions. Similar to the planned budget spending, it is needed to spread the commitment into the project financial periods. This commitment spread should be aligned with the project schedule to determine the start and end dates of each cost line item. This will ensure that planned commitment invoicing is aligned with the planned budget spending. Again, each line item can be spread in different form than other line items. Some could have linear spread while others could front or back loaded, or any other format. When awarding of commitments (contracts, purchase orders and others) start to happen, the project investor might find it necessary to adjust the approved budget to match the actual awarded value of commitments. This could result in decreasing or increasing the budget, transferring funds from one cost center to another or even transferring funds from one project to another. To achieve transparency and accountability in this process, budget request template will be used. Those requests should have all supporting documents attached as well as links to other project records to detail the reason for this adjustment. In addition, it will have a workflow to formalize the process of submitting, reviewing and approving those adjustments. The workflow could have many branches and conditions to incorporate the authority levels in approving those changes. With the contractors start the executing the project’s scope of work, changes could happen. Changes could happen for many reasons including intent of documents not “reasonably inferable” and corrections required, unknown conditions necessitate changes, project investor or owner’s requirements change, changes in code or changes in interpretation of code, specified product no longer available, consider new product because of cost savings or other benefits, specified product inappropriate, adjust contract sum for difference in actual cost versus allowance, estimated quantity of work for unit prices changes, revision of unattainable requirement among many others. Those changes could have an impact on the awarded contracts and of course the project budget. This data will be captured in what is known as the Change Events where the cost impact on both budget and commitments are captured. This will ensure that there will no approval for a commitment change order before the additional budget for this change has been formally approved. This will enable approving the change order that could affect one of the awarded commitments for which the contract value will be revised automatically. Of course, PMWeb PMIS not only will capture the details of change orders for a commitment contract but change orders for all commitments for that particular project as well as all other projects managed using PMWeb. Similar to other modules, the change order will have all supporting documents attached as well as a workflow to capture the approval process. As work progresses, contractors will submit their progress invoices for completed and approved scope of work to get paid. For the Project Investor, those are the actual cost incurred against the project. The total value of the certified progress invoice should reflect the adjustments that are part of the contract’s terms and conditions such as retention on completed works, retention on material stored on site, advance payment recovery if such payment was made by the Project Investor, Tax Withheld among others. The progress invoice will be repeated at the end of each month until the project comes to closure. Of course, approving a progress invoice does not mean that this invoice was paid. Payments of certified and approved progress invoices need also to follow the approved terms and conditions which could be to make payment after 45 days of approving the progress invoice. In addition, there are contracts that set a limit on minimum value of the invoice to be paid. In other words, if the invoice is less than certain amount, then the progress invoice of this particular month will be paid along with the next month payment should the total exceed the minimum payment threshold. All the project’s financial transactions are captured in a single repository known as the cost ledger. This will enable the Project Investor to report on the project’s financial status using what is known as the Cost Worksheet. This is a spreadsheet that can be designed in different layouts showing different cost data columns, creating new data columns for which values will be calculated from other fields, group data by the different levels of the CBS, filtering data depending on record status, reporting on cost data within a specific financial periods range among others. The cost worksheet will provide a single version of the truth on the project’s financial status. Monitoring, evaluating and reporting project’s budget performance should not be limited to how accurate the project budget is but should also address the accuracy and efficiency of spending the project budget as it was planned. Therefore, at the end of each month, an analysis should be done to compare the actual cost incurred to date with the planned budget spending for the same date, or Planned Value (PV). This is a very critical performance indicator as projects who fail to use their blocked planned budget have deprived the organization from using those unused funds on other projects. The Cost Variance (CV) between the Planned Budget (PV) and actual cost (AC) or what was invoiced by the contractor is the metric used to quantify this KPI. In addition, the Cost Performance Index (CPI) provides the metric for measuring the efficiency in spending the project budget. A Project Investor will always seek to have the CPI at 1.0 as a CPI that exceeds 1 indicates that actual invoicing exceeds what was originally planned and for which the investor might not have the funds to cover that while a CPI that is less than 1 indicates that the approved budget spending is not being utilized. Using the CPI alone to report the accuracy and efficiency of spending the project budget might be misleading as the Contractor although might have invoiced the planned amount but it could be for work that was not planned to be executed in the current period. Contractors sometimes might opt for this to improve their cash flow where they will execute works regardless if this work is in accordance with the approved project schedule or not. This could increase the risk of project delays as the contractor might delay critical works that could earn him less funds than other non-critical works but with higher pay. 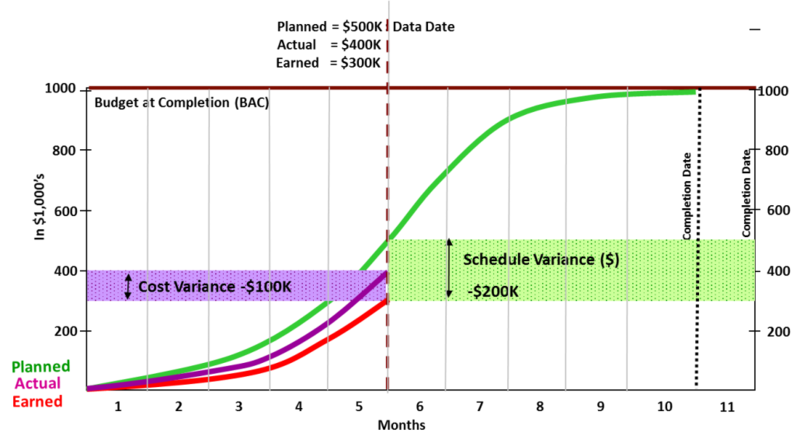 Therefore, the Project Investor should report on the Schedule Variance (SV) which is the difference between the planned percent (%) complete of a cost center (PV) and what was the actual % complete for the same cost center based on the updated project schedule, also known as Earned Value (EV). A negative value indicates that the actual progress of this scope of work is less to what was planned. The Schedule Performance Index (SPI) helps in reporting the efficiency in completing the work as it was planned. The chart below explains the earned value metrics used to report on the budget efficiency for a project that uses lump contracts for all commitments. Assuming that the project budget is US$ 1 million which also equals the awarded lump sum commitment contract. At the Green curve or Planned Value (PV) details how the US$ 1 million project budget also known as Budget at Completion (BAC) will be spent during the project’s 10-months duration. The Purple curve or Actual Cost (AC) represents the total of progress invoices certified to date for completed work on site. The Red curve or Earned Value (EV) is the actual % complete for the project scope multiplied by the Budget at Completion (BAC) for that specific project cost. Therefore, at the end of month 5, the Planned Value (PV) for the project was US$ 500K, the total amounts of certified invoices (AC) was US$ 400K while the Earned Value (EV) for actual performance achieved was US$ 300. This indicates that that project has spent US$ 100K (CV) to what was planned to be spent for which the efficiency for spending the project is 0.8 (CPI) or 80% to what was planned. In addition, the project is US$ 200K behind in invoicing to what was planned to be completed as per the approved project schedule for which the efficiency for achieving what was planned is 0.6 (SPI) or 60% to what was planned. Those unfavorable measures and key performance indictors should be alerting to the Project Investor as the effort spent in ensuring that the project budget equals to what was commitment could become of no value if the project will continue to perform in the same trend. A Project Investor does not want to spend time in trying to find out the latest and true status of the project cost status. Having a dashboard that will summarize the real-time data needed to generate the information to provide the knowledge needed to provide the Project Investor with the insight to make better and faster sound decisions on the project investment is what matters most. The dashboard will provide the needed metrics and measures to provide a single version of the truth on the project’s status and health. 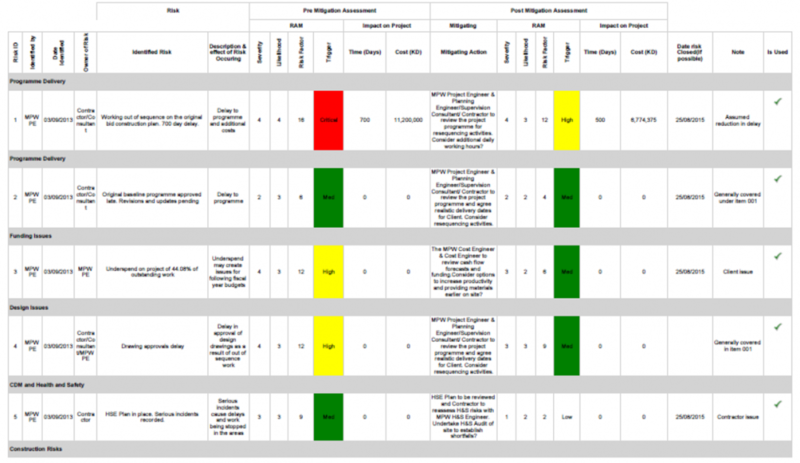 The first dashboard provides an overall summary of the project cost status including current CPI and SPI status, summary of original and anticipated budget, summary of awarded commitments original and revised value, summary of approved and pending change orders, summary of invoiced work and retention and summary of contingency draw down. In addition, it shows the CPI and SPI trend for the elapsed performance period. The dashboard also shows the budget breakdown in a donut chart. 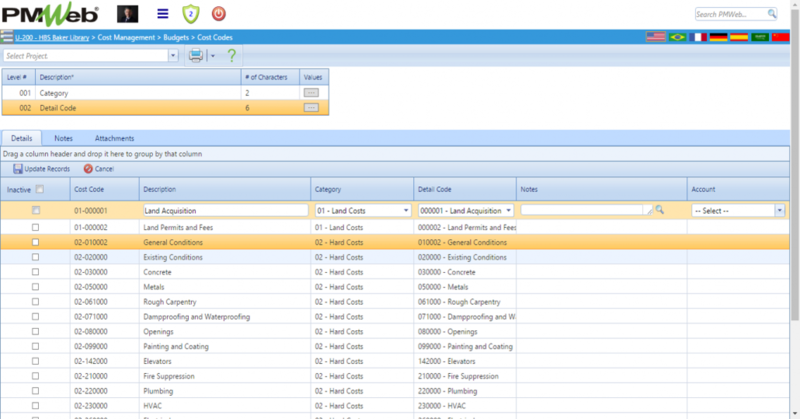 The details of awarded commitment, change orders and progress invoices is also displayed. The second dashboard displays the cost worksheet data at level of the cost breakdown structure showing the details of original budget, adjustments, anticipated budget, original commitment, approved change orders, revised commitment, pending change orders, projected commitment, actual progress invoice to date (actual cost), uncommitted scope, total forecast commitment and variance between total forecast commitment and anticipated budget. It also shows the breakdown of the total forecast commitment as a donut chart, the cost breakdown structure levels that have variance between total forecast commitment and anticipated budget as a histogram and the contingency draw down area chart. 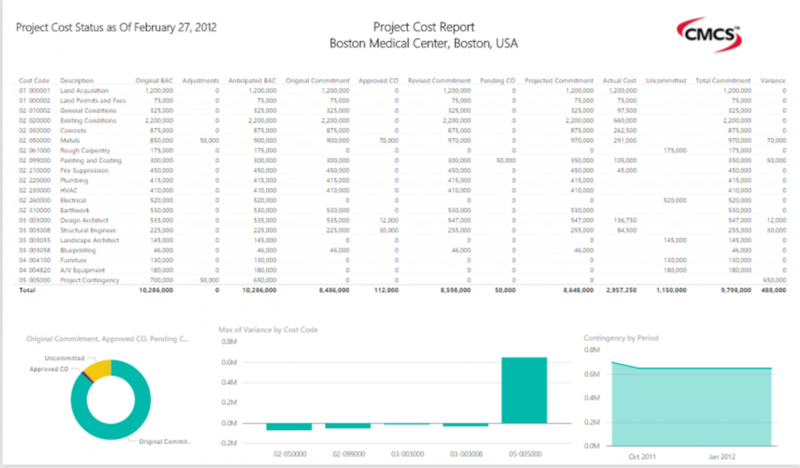 Other dashboards can be also created to report on other aspects of the project’s performance as it relates to schedule, quality, risk among others. 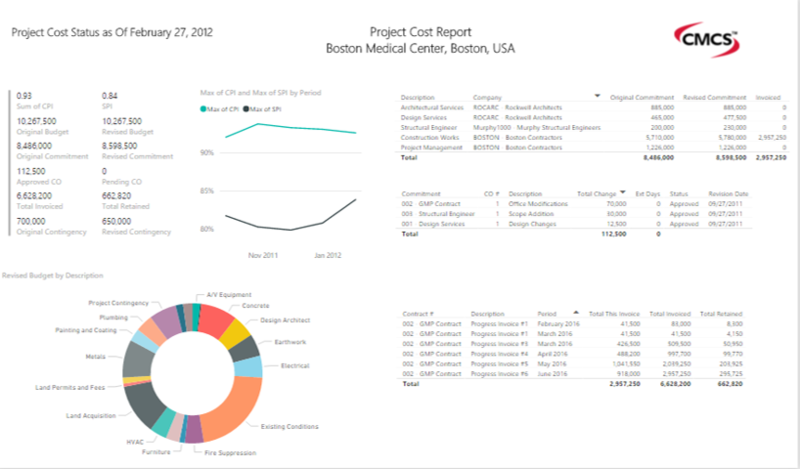 Dashboards can be also designed to report the performance on a single project, program or portfolio of projects. Big Data – The Fuel To Run Your Projects Can Technology Reduce the Stress of Managing Projects?